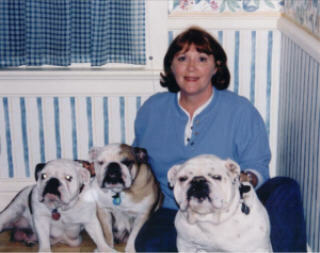 Janel Messmer has been breeding companion animals for over 25 years. She has been working with Bulldogs for 8 years now. All Messmerbull's Bulldogs are bred to AKC standards, and are raised in the house as loving companions. The puppies are vet-checked at six weeks of age and receive their first vaccinations at that time also. The puppies receive a 5-in-one shot that includes Canine Distemper, Adenovirus Type 2, Parainfluenza, Parvo MLV, Corona killed. Puppies are sold with a contract and are guaranteed for health.